Red Excitement (l) gave Winx a scare in the last Chelmsford Stakes but won’t be leading this time. There will be no repeat of the daring tactics used by Josh Parr on Red Excitement in the last edition of the Chelmsford Stakes when it took a champion to run him down. After clearing out by as much as 10 lengths a year ago, Red Excitement held off all but Winx in the Group Two 1600m-race. There is no Winx to contend with on Saturday at Randwick but her trainer Chris Waller has eight of the 20 entries. Trainer Gerald Ryan opted to bypass last week’s Rowley Mile at Hawkesbury with Red Excitement when the gelding drew a wide barrier and he will go into the Chelmsford having not raced since he was unplaced in the Civic Stakes on June 30. “He hasn’t been out of work since his last race but he is first-up without a trial so he won’t be going out in front like he did last year,” Ryan said. “There will be too much speed in the race for that. 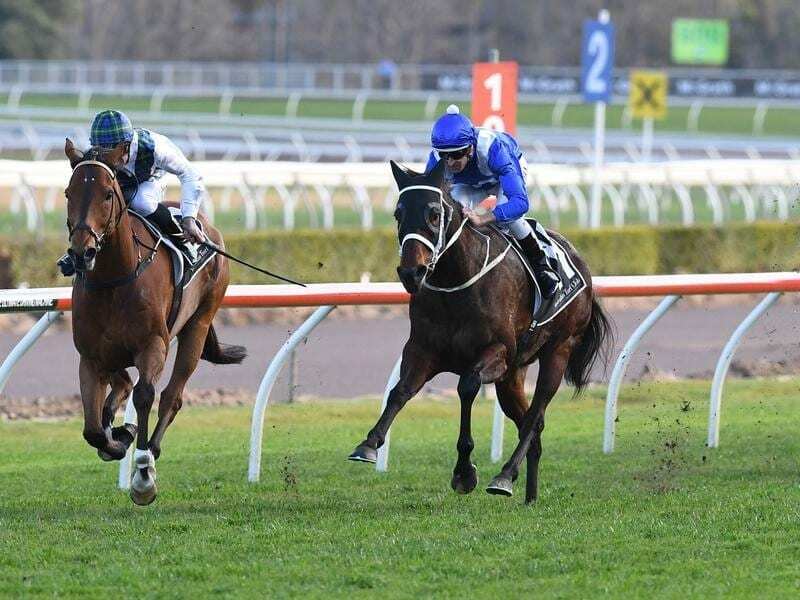 It’s Somewhat, Godolphin’s 2017 Doncaster Mile winner, is the highest-rated of the Chelmsford entries and is also one of 26 nominations for the Group Two Tramway Stakes (1400m). The Waller-trained Australian Oaks winner Unforgotten is the $4.50 Chelmsford favourite in the TAB’s first market ahead of Prized Icon at $6. Ryan’s other feature race entry is Sweet Ava in the Group Two Furious Stakes (1200m), the second leg of the four-race Princess Series for three-year-old fillies. Sweet Ava hasn’t raced since the autumn but finished second to the much-hyped More Sundays in a recent barrier trial. “I’m 50-50 about running her,” Ryan said. “She might be a little bit behind to take these fillies on but if she doesn’t run on Saturday she won’t get to the Flight Stakes (September 29).